Let's look at a few of the ways you can price your services in Nusii. Probably still one of the most common ways to price a proposal. Here's how to add fixed pricing. Firstly, to add a pricing section, click on + Add Blank Pricing Section. This will insert a pricing section. Here you can select the type of pricing you want to use. In this case, Fixed Pricing. If you want to include optional pricing packages e.g. Package A, B or C then you can do this by checking the Optional checkbox. With this selected your client will need to choose a pricing package before they can accept your proposal. You'll notice that you can also add separate line items to your pricing section, again you can choose whether to use Fixed, Recurring or Per X. You can also save any pricing section as a Reusable Section by clicking on the green Save as reusable section button. To reflect a recurring cost, select Recurring from the dropdown menu. The rest of the functionality is the same as with Fixed pricing, except for the way in which it's displayed in the proposal. As you can see below, a recurring price or cost can be ongoing for an indefinite period of time. This means there's no way to give a Total Cost. A recurring cost is displayed as below. Of course, if you also include a Fixed cost as well as a recurring cost, the fixed cost will be shown in the Total. If you need a Total cost to be displayed for your recurring service, then perhaps using the Per X option might be more suitable. Per X pricing gives you a little more flexibility than recurring pricing. 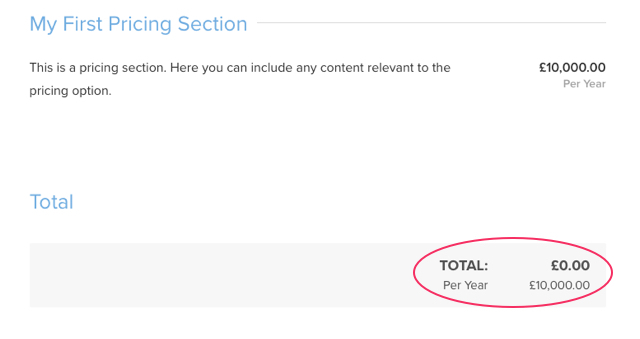 In the example below you can see we've chose to charge 10K per month, for 12 months. This means we can display a Total in the proposal as we know the duration of the recurring cost.